Baseball Hall of Famer Yogi Berra died Tuesday night. He was a member of 10 World Series championship teams as a as a Yankee and a three-time MVP He had 358 career home runs and was considered one of the greatest players of all time on the field. He was also one of sports most quotable players with phrases or Yogi-isms that have become part of popular culture. 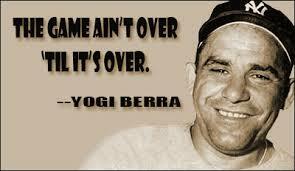 Here is a sampling of famous Yogi-isms.